While dating, my dear husband would have a habit of stopping at Jack in the Box and getting a few of our favorite things: a croissant breakfast sandwich, two tacos, and mozzarella cheesesticks. Then he would drive me home just in time for curfew, and we would sit unwrapping our goods on my parents kitchen table. It became such a tradition, that even on our wedding night, we took the classic car that we borrowed into town, and through the drive through to pick up our traditional vittles. Since moving to another state, our choices in restaurants have changed, but apparently our preferences have not. After work a few days back my dear husband came in through the door with some groceries and asked if I had received his text message. I told him no, as I went to check my phone. There, as an attachment, was a picture of some TGI Friday Mozzarella Cheesesticks. He explained further how he thought these would be great wrapped in bread like a breadstick. Thinking it over for a 1/2 a second, I applauded his ingeniousness and promised I would give it a try. So, true to my word, I tested his recipe idea today. 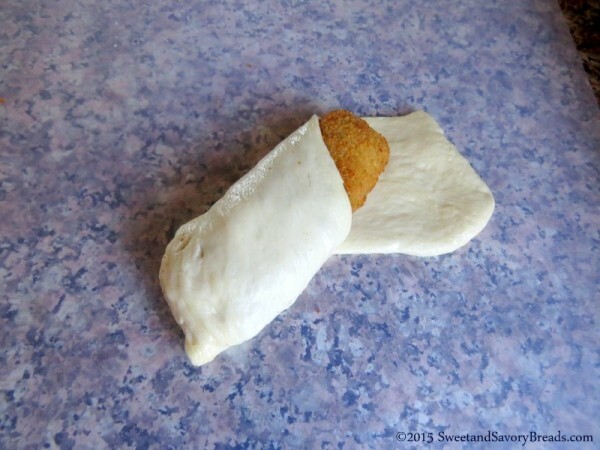 It turns out it is as easy as wrapping the risen bread dough around the frozen cheesesticks, and then placing them in the oven. I tested baking the cheesesticks first and then wrapping, but the cheese was overcooked by the second bake. So learn from me, and do it the easy way: once! I will absolutely make these again as the garlic parmesan exterior made for a slightly crunchy and flavorful outside, while the soft inner bread lent my teeth something to sink into. Next, the chewy exterior of the cheesestick gave way to the gorgeous melty mozarella cheese itself. And there you have it: my husband’s cheesestick breadsticks which he has aptly named “Magic in the middle breadsticks”!While dating, my dear husband would have a habit of stopping at Jack in the Box and getting a few of our favorite things: a croissant breakfast sandwich, two tacos, and mozzarella cheesesticks. Then he would drive me home just in time for curfew, and we would sit unwrapping our goods on my parents kitchen table. It became such a tradition, that even on our wedding night, we took the classic car that we borrowed into town, and through the drive through to pick up our traditional vittles. I will absolutely make these again as the garlic parmesan exterior made for a slightly crunchy and flavorful outside, while the soft inner bread lent my teeth something to sink into. Next, the chewy exterior of the cheesestick gave way to the gorgeous melty mozarella cheese itself. 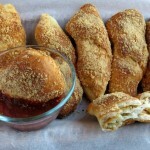 And there you have it: my husband’s cheesestick breadsticks which he has aptly named “Magic in the middle breadsticks”! Mozarrella cheesesticks wrapped in bread dough, then rolled in butter and parmesan garlic to make the most scrumptious breadsticks imaginable! Place the frozen rolls in a greased pan covered with greased plastic wrap. Let sit in a warm place for 2-4 hours. -Or- check package for speed method if in a hurry. Once the rolls have doubled in size, preheat the oven to 350°. 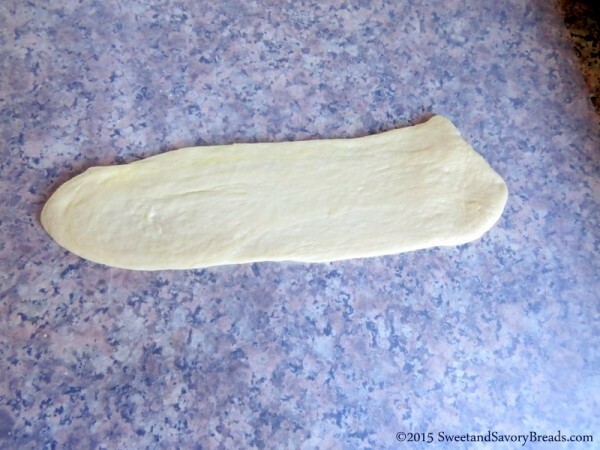 Take one piece of dough, and roll on a surface until it is approximately 2-1/2" x 8". Place one cheesestick and place at an angle towards one side. Roll it up and pinch the ends. Combine the parmesan and garlic in a shallow dish. Also place the melted butter in its own shallow dish. Place the rolled up cheesestick into the butter and coat, then dredge in the parmesan mixture. Place on an ungreased pan, and bake for 15 minutes. 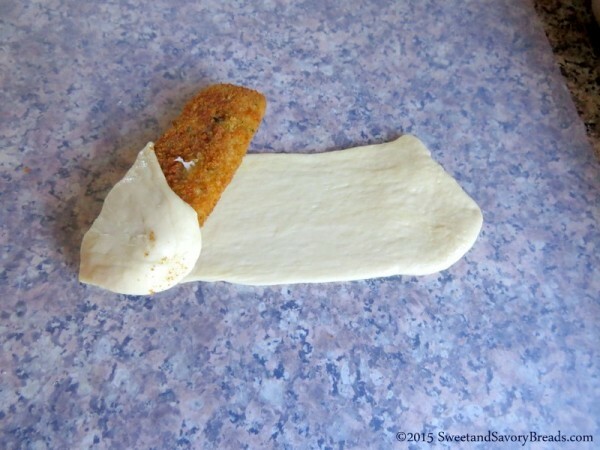 Posted in Game Day Party RecipesTagged Appetizer, Bite Size, breadsticks, Finger Food, Game Day Food, mozzarella cheeseBookmark the permalink.